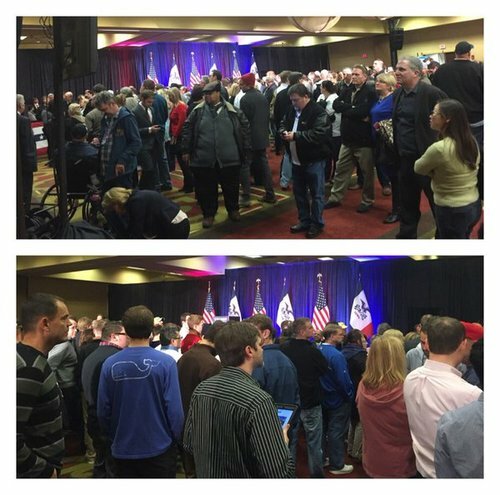 Tonight marks the first major electoral event of the 2016 presidential cycle: the Iowa caucuses. 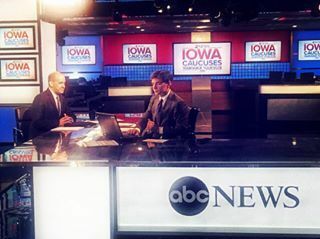 Keep checking back for updates as the ABC News political team reports from the Hawkeye State on caucus night. In electing their delegates, Democratic caucus voters separate into groups according to the candidate they support. The candidate must receive no less than 15 percent support, or else the candidate is eliminated as a viable candidate and his or her supporters are then courted by other groups. 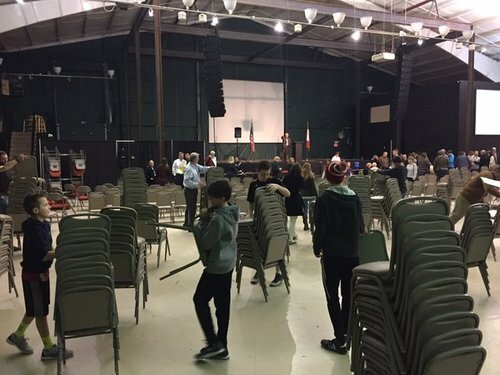 ABC's JOSH HASKELL: It’s impossible to predict turnout for the caucus, but many including the Secretary of State think the Iowa GOP could see record turnout motivated by first-time caucus-goers supporting Trump, anger towards President Obama and the establishment, record numbers watching the debates, and the high number of candidates. 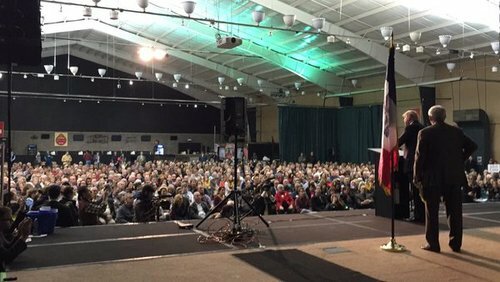 The Iowa GOP set a record for turnout in 2012 with 121,501. Although Iowa’s Secretary of State wouldn’t predict turnout figures for the Iowa GOP, he was in charge in the 2008 election and says his office saw some signals of high turnout then and they’re seeing them again. 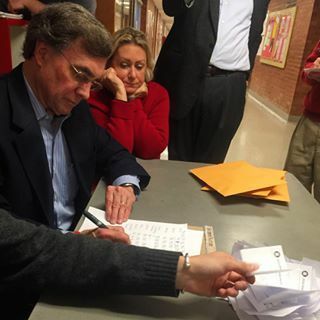 Historically, roughly one-fourth of registered Democrats and Republicans in the state actually show up on caucus night to vote. 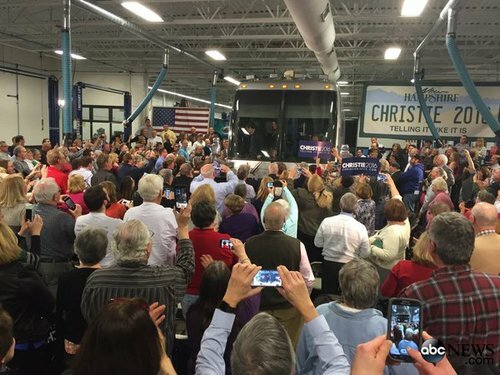 ABC's RICK KLEIN: "This sounds like a record-breaking night," Iowa GOP Chairman Jeff Kaufmann told ABC News. 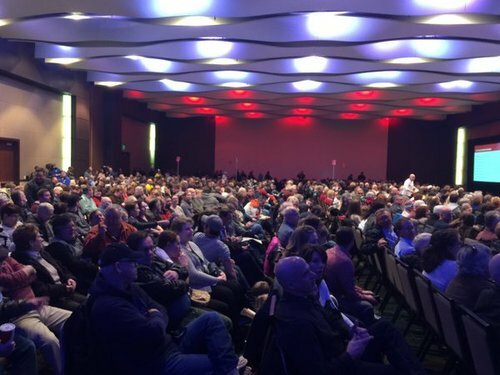 Again – they have long thought they would shatter the (rather paltry) record – and conventional wisdom has been that big turnout favors Donald Trump, who is bringing new voters into the party caucuses. The state party has gotten calls for weeks from former Democrats who say they’re switching to the Republican Party specifically to support Trump. "Too early, we will find out in an hour or so,” he said. “We are very proud of the campaign that we ran. We ran a positive campaign. We will find the results out soon enough." He added that despite what happens, "I think what we have shown is that the American people are very dissatisfied with the situation where the middle class continues to shrink while almost all new income and wealth goes to the top one percent." 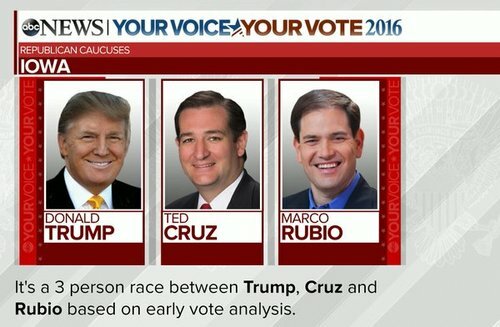 JUST IN: It's a three person race between Donald Trump, Ted Cruz and Marco Rubio based on ABC News' early vote analysis. 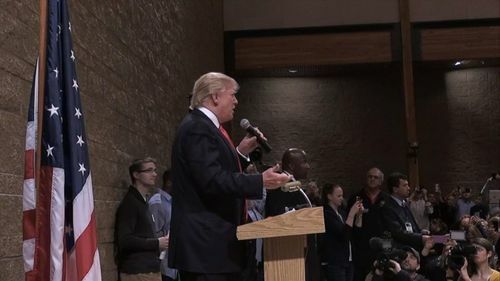 ABC NewsThe Republican frontrunner reiterated his campaign promises in Iowa during the caucuses. his wife, Melania. 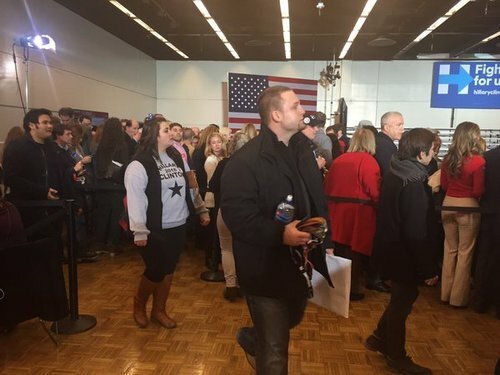 He seemed impressed by the turnout and thanked the crowd for coming out to caucus. When asked if he thought he would win, Trump said that "we'll have to see what happens." He also acknowledged that he is "a little bit nervous" about the first election event this race. 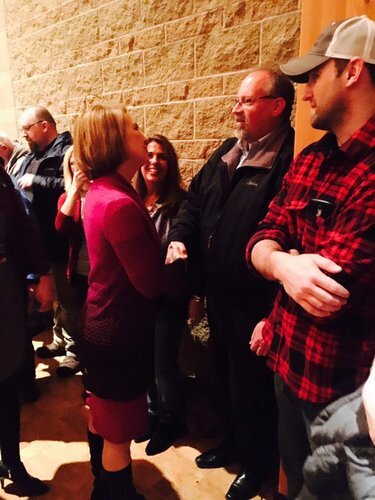 Carly Fiorina also stopped at the same caucus event, and addressed the crowd prior to Trump. 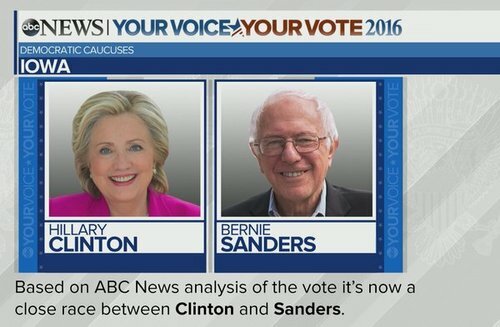 UPDATE: It is now a close race between Hillary Clinton and Bernie Sanders based on ABC News vote analysis. eventually had to choose between Sec. Hillary Clinton and Sen. Bernie Sanders. 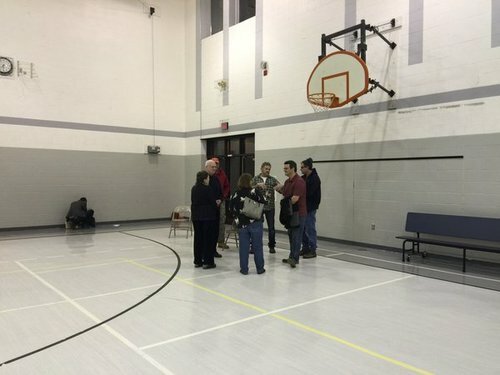 Four of O’Malley’s supporters chose to to the Sanders camp and the other supporter chose to leave the caucus. 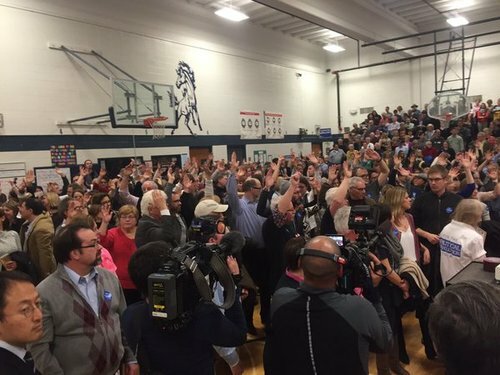 At the end of this caucus, Sen. Sanders got 5 delegates and Clinton got 3. ABC’s ANDREA GONZALES: Snapchat users in Iowa can use non-traditional ways to be informed of caucus information. 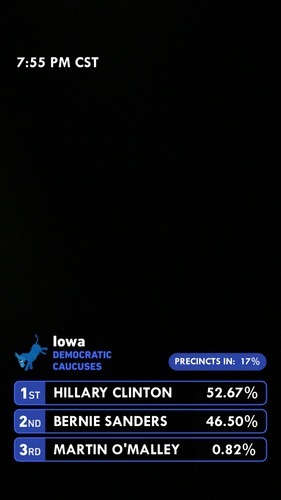 Caucus-goers in Iowa can access caucus-festive filters on Snapchat. There’s a Republican and Democratic filter that shows what place the top candidates are in with the percent of the vote. It also includes the percent of precincts reporting and the time of when the picture or video was posted. Dang, among Iowa caucus-goers under 25 years old? Sanders hits 86 percent support in exit poll data. ABC's MARYALICE PARKS: A text from the Bernie Sanders campaign to supporters reads, "Counting may be taking long at your precinct. It is extremely close! It is important that you stay until the end to fight for every delegate for Bernie." One of the most interesting things so far: 10% of Iowa GOP caucus-goers going for Ben Carson, despite collapse over last few months. ABC's MARYALICE PARKS: Sources close to the O'Malley campaign tell ABC that Governor O'Malley is set to announce that he will be suspending his campaign at his caucus party tonight at Wooly's in Des Moines. He is likely to speak at 10:30 p.m. EST. 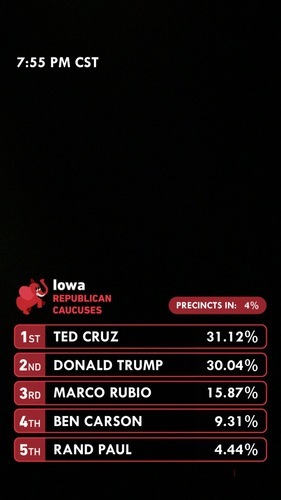 Precinct 4 in Clive, Iowa has Rubio ahead of the entire GOP pack. 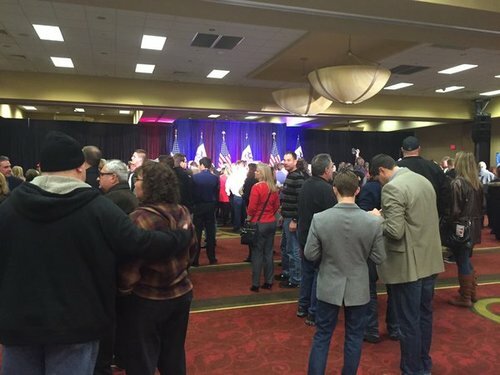 ABC's SHUSHANNAH WALSHE: The Iowa GOP now says they have officially broken turnout records. They have long thought they would break the turnout records. 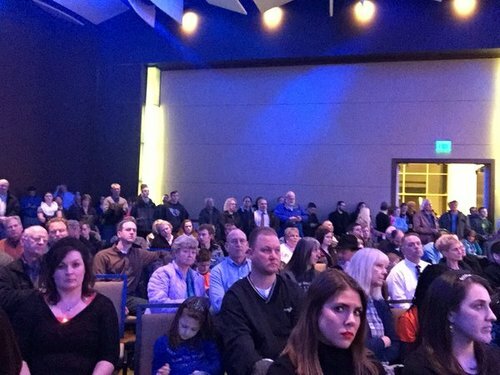 ABC's MARYALICE PARKS: Bernie Sanders fans have begun filing into his caucus watch party in Des Moines, Iowa. The people here cheered and chanted “Bernie!" when MSNBC ( up on big projectors) said “he has a chance." One guy yelled — "and O’Malley just dropped out!” — to more cheers. JUST IN: Mike Huckabee is suspending his campaign. NEW from Clinton camp: "Turnout is high, which the Sanders campaign has always said would benefit them. But we believe we have won tonight." 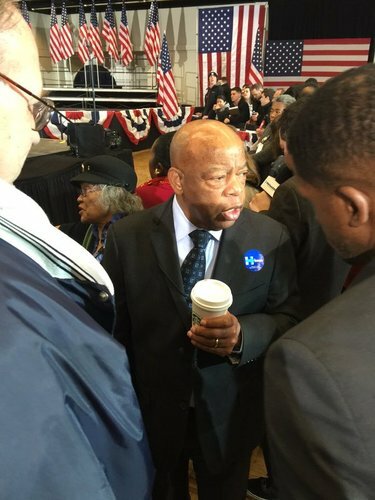 ABC NewsABC's Mary Alice Parks takes us behind the scenes at Sen. Bernie Sanders' caucus event. ABC's SHUSHANNAH WALSHE: There is still 25 percent of the Democratic vote out in Polk County. Des Moines is located in Polk County and it’s the most populous county in the state. Only 75 percent of the vote on the Democratic side is in, meaning there is still 25 percent of the vote to be counted. 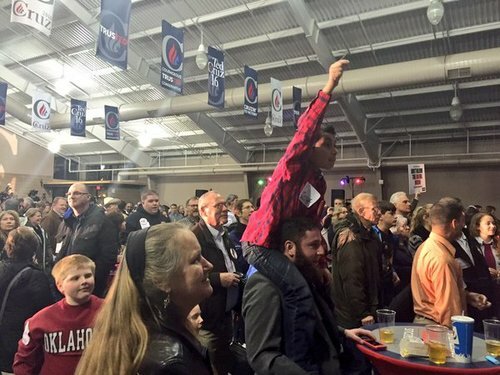 Crowd at Cruz rally chanting "We want Ted! 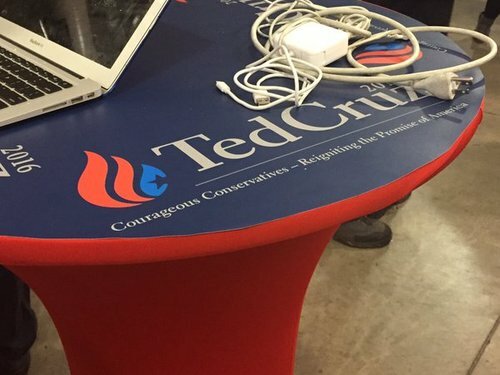 We want Ted!" 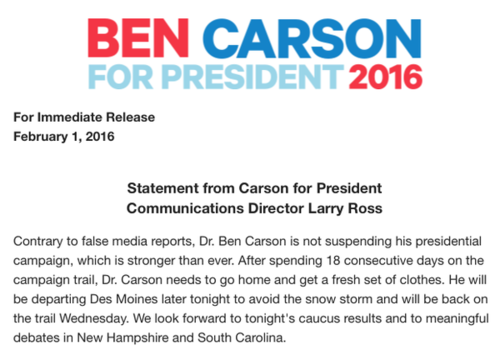 JUST IN: ABC News projects Ben Carson will finish fourth in Iowa GOP Caucus.